Being prepared as much as possible will make the difference between just surviving, or enjoying your time in Tankwa Town – which is why we have a Survival Guide. The list below provides some general suggestions regarding health & safety in Tankwa Town. For more detailed info, always read our Survival Guide. All the normal rules of road safety apply. Travelling in convoy is strongly recommended on the R355 (the road leading to our event site). The last 100km is on dirt road. It has some bad patches, so drive carefully, and avoid the temptation to rush. It’s tempting to feel like you’re almost there when you hit the dirt – you aren’t. It takes about an hour and a half to cover the dirt section. AfrikaBurn crew will not be patrolling the road, and are not able to provide assistance outside of the event. Remember to bring your own First Aid kit, and adequate supplies of any prescription medications. Always have hand sanitiser on your person & at your camps. There will be medics on site, however they are there for emergency situations only. The medics may turn patients away if the situation is not an emergency. 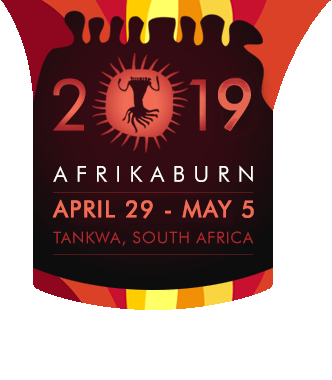 In case of severe emergency medics can evacuate patients by road or air, but costs associated with evacuation will not be covered by AfrikaBurn. All non-life threatening and stabilised minor events. We have a small fire brigade, and are far away from major towns – the focus is on avoidance. Be conscious of your usage; do not leave any candles unattended, put your cigarettes out properly & always put your braai fires out before you leave your camp. If you want to bring additional fuel, you MUST let the team at the gate know so that it can be safely stored at our fuel dump. This applies to cars and campervans as well – keep them more than 5 metres from any fuel or fire. Camps should always have a 5-litre bucket of sand on hand to put out fires quickly and easily, in addition to a fire extinguisher. In the case of tent or structure fires: keep out, do not attempt to enter the tent / structure to remove possessions. In the event of a fire at your tent that you cannot put out with a fire extinguisher, contact your nearest Campsite Manager, fire brigade and/or authorities. You may not burn unapproved artworks. If you would like to burn something let the art co-ordinator know. All camps need to have a serviced fire extinguisher at their campsite. Ensure all camp members are aware of the location. We’re all in this together, and we’re responsible for each other, so it’s a good idea to make sure that you appoint someone in your camp to be the “Camp Safety Officer”. They can be responsible for things like fire extinguishers, first aid kits, burn blankets, and so on. For more Health & Safety info, please read our Survival Guide.